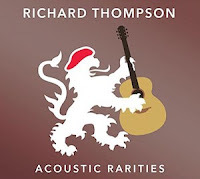 The Little House of Concrete Music: Richard Thompson :"Acoustic Rarities"
Here's further proof (as if any is needed) that Richard Thompson sits somewhere towards the very top of the singer-songwriter pecking order. It's hard to figure what defines a Rarity in RT's view—presumably something that didn't fit in somewhere else or ended up on the back-burner, setlist-wise. In some cases (What If? ), it's fairly obvious why, but skim through the rest. These, remember, are, more or less, the castoffs. Your average singer-songwriter would use something like They Tore the Hippodrome Down as the centrepiece of an album. Here, it's the start of a steady build through the classic Never Again, a long-time favourite (The Poor Ditching Boy), the bleak masterpiece that is End of the Rainbow and a couple of Fairport Convention classics in Sloth and Poor Will. The rest of the material ain't too shabby either. And remember, folks, these are, in effect, the also-rans. Outstanding.